We are a very close extended family, mum, dad, three sisters, one brother, grandparents, aunties and uncles. We all dream big and have always appreciated everything we have in our lives. Even the littlest of things which we would thank God for all the time. However, we did not even expect the unexpected. This was the day when our lives fell apart and our perfect world turned upside down. We did not even have the thought of cancer being a possibility nor the reason why she would have been ill initially. It was all unforeseen. We had a few signs which we had no clue of. It started with an infection, and during winter season we thought of it as normal and didn’t take it too seriously. We took many trips to our local GP and soon Zuni was admitted into Ealing Hospital. Mum noticed many lumps on Zuni’s back as well as the fact that Zuni was not her bubbly self any more. Zuni was then admitted into Oxford, which then meant that her condition was deteriorating and this ‘infection’ was getting more serious. Soon enough, Zuni was transferred to Great Ormond Street Hospital, where Zuni was on a ventilator for one week in the intensive care unit. The whole family were praying for her wellbeing. Nobody was sure if she would make it. Zuni’s mum and I had to stay at a nearby hotel. The family were home worried sick. 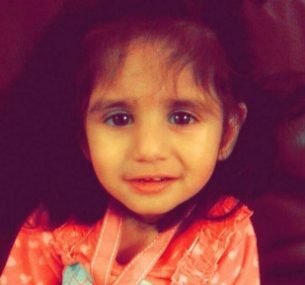 Zuni was then admitted into a ward in the hospital and was taken off the ventilator. Zuni had to then begin her treatment. This marked the beginning of a new journey with its ups and downs, with a different lifestyle as if we were all starting over again. Zuni’s treatment lasted over three years. 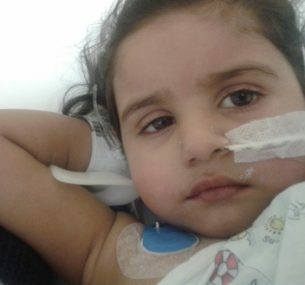 Zunairah had a nasogastric tube and a port on the left-hand side of her chest. This meant that Zuni was very fragile. The chemotherapy caused various dramatic changes in Zuni’s appearance. It started with Zuni gaining a large amount of weight, making her look tremendously chubby, even on her face. As soon as we got used to this change with Zuni, we faced another change, which as a family it was hard to cope with. Zuni’s hair began to fall out due to the chemotherapy and soon she had no hair left. Following from this, Zuni ended up losing a large amount of weight. Our bubbly Zuni soon became moody. As a family we had to keep up with her anger issues and mood swings. Zuni even forgot how to walk. With the help of the nurses and doctors, as a family we worked together to get her walking. 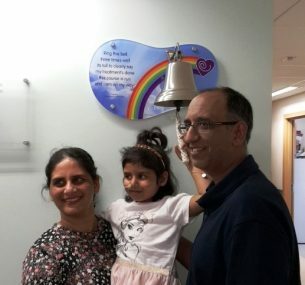 Zuni built very close relationships with her nurses and doctors as she continuously went to Great Ormond Street Hospital and Hillingdon Hospital to have all her chemotherapy. We would like to thank Great Ormond Street Hospital and Hillingdon Hospital for all the help they gave us and Zuni. 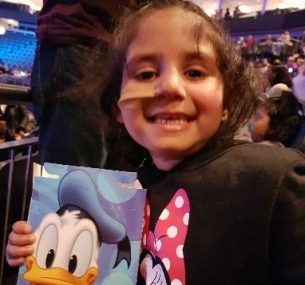 Children with Cancer UK generously gave our family tickets as well as the opportunity to see the famous Disney on Ice at one of London’s best venues, The O2 Arena. This was also a perfect opportunity to celebrate Zuni’s remission. On arrival, Zuni and our family, were welcomed to the VIP Club Lounge where we could enjoy the lovely atmosphere with the music and drinks that were served before the show. We ate lovely food which was was perfect considering we had a really long journey. 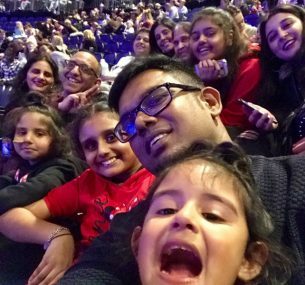 During Disney on Ice, we saw so many spectacular performances from various Disney characters such as Ariel, Timone, Pumba and Tinkerbell. We sang along to all the Disney songs accompanied with a lot of Disney on Ice Popcorn. We had our favourites Mickey, Minnie, Goofy, Donald and Daisy narrated the whole story beautifully for us. It really was an amazing performance. The spectacular line-up included Mickey and friends, particularly Minnie who introduced us to each ‘destination’ around the world. Finally, we were left with an icy feeling with an icy performance by Elsa and Anna with Let it go and Frozen. Zuni enjoyed watching all the Frozen characters with her sister especially, as it is her favourite Disney movie. Zuni and her little sister Ziya are major fans of Frozen. She happily sang along to all the songs and it was a beautiful way to end Zuni’s fantastic night. Overall, as a family it was an amazing experience that we will never forget and we would like to thank Children with Cancer UK for making this night and day one of the finest and most beautiful days our family has experienced.